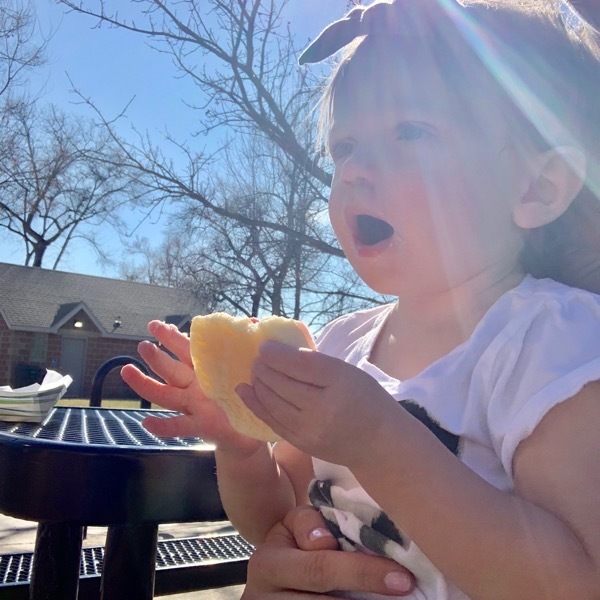 There is a new Friend to Friend post up… you can check it out HERE! It has been a few days since we last caught up so let’s cover some things before we move on to the tantrums that we may experience throughout the year. *Back to running in the dark! These time changes always take some time to get used to again. I am positive we earn bonus deposits in our training bank accounts each time we still get up and run after Daylight Savings. Monday: 5 miles @ 8:19 average and my body felt like junk (aka the taper… but I’m not sure if it really did feel like junk or it was just because I have been telling myself that I always feel bad in the taper and then great on race day… not sure). *Sporting the Glycerin 17s and feeling pretty cool that these are the shoes that Des Linden uses for a lot of her training runs. Socks to cover your ankles when your tights are a little short on you are always the most fashionable option. 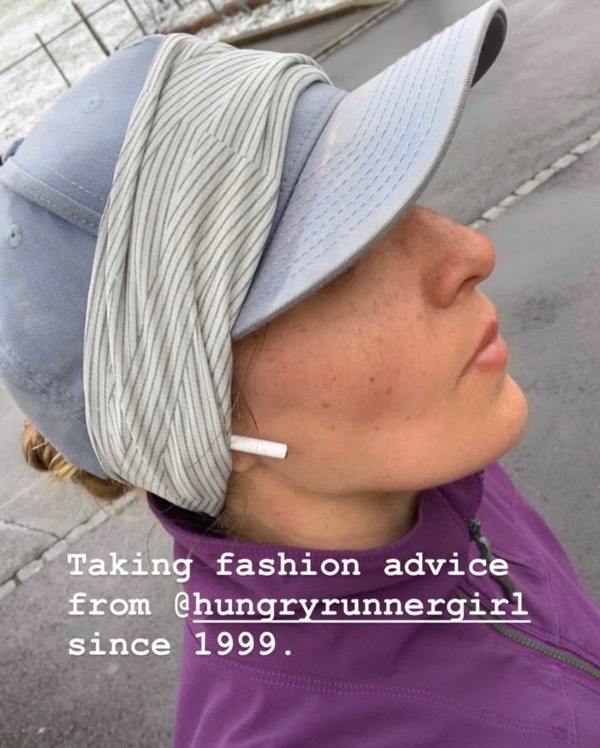 *Speaking of fashion, one of my best friends that lives in Switzerland now (she is the one I visited when she lived in Thailand) posted this… I’m telling you, if it is rainy and cold then you need to use a hat (to block the rain from nailing your eyeballs) and a headband over to keep your ears warm. She is training for her first marathon wahoo! *Tuesday: 3.2 miles with my new running buddy @ 8:50 average. She wanted to join me and was up and ready to be back in time for school so we went for it. 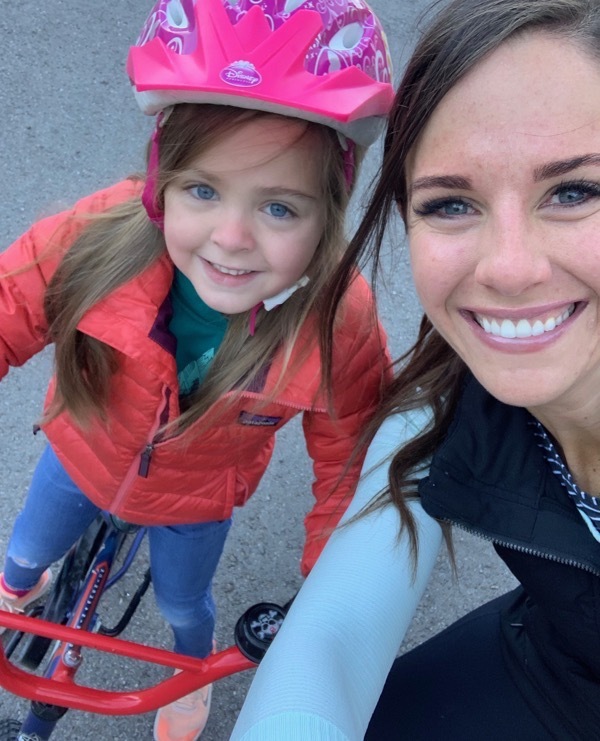 I have a feeling this summer there will be many runs with Skye in the jogger with Brooke and Knox on their bikes on the bike trail. *Later on I went to Burn Bootcamp with my sister. The workout was —> Metabolic Conditioning w/ Beastmaker Finisher. 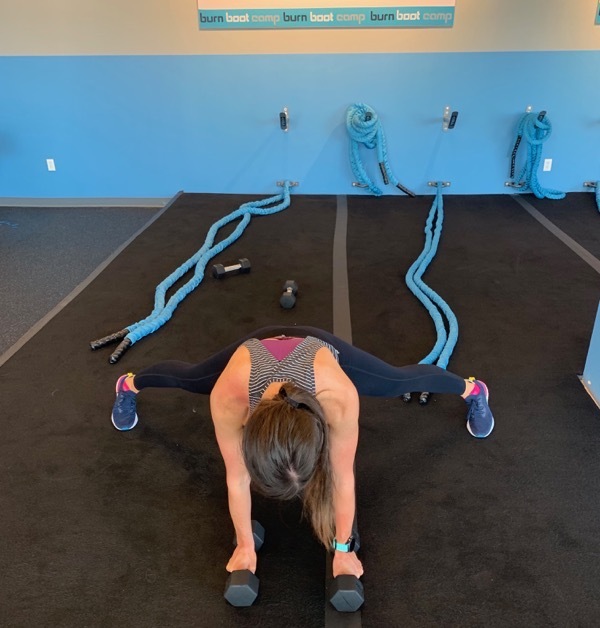 We finished with these plank jacks that went right into overhead presses with the weights for a few minutes on repeat and it burned like crazy. Time to take a break from bootcamp to let my body get ready for this race and I am definitely going to miss it! *My family is quite into salad bars these days. We all bring a bunch of ingredients to combine into a plate of happiness. 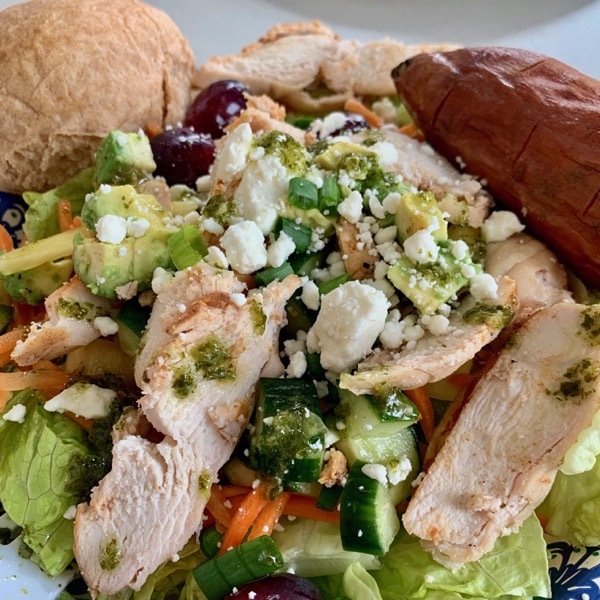 This salad included grilled chicken, avocado, feta, cucumbers, carrots, pineapple, peppers, a sweet potato, a roll and this vinaigrette dressing. Also, I put a few grapes on my salad to test them out again… I thought I was allergic to them because every time I used to eat them my throat would get itchy and swollen but I ate a few and nothing happened. Maybe my grapes and cottage cheese combo (if you haven’t tried this, please do soon) will be back in my life again soon. PS when Brooke saw me eating a grape she said, “NOOOOOOO MOM.” She was very concerned! 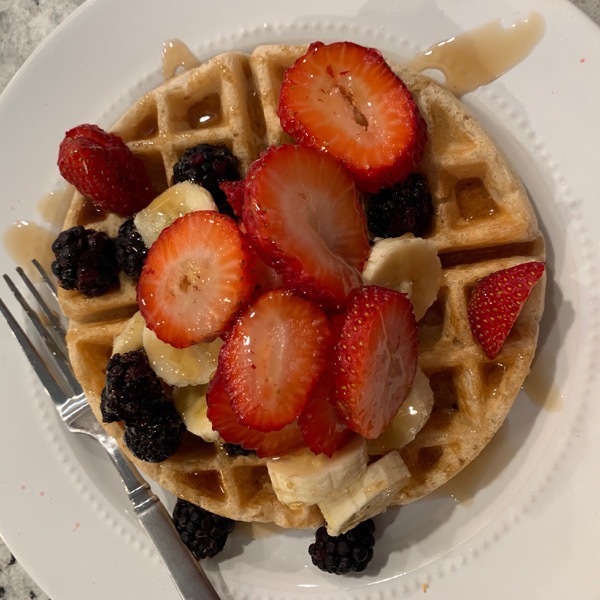 *The amount of waffles/pancakes I eat with fruit on top is at an all time high (maybe even higher than when I was pregnant with Skye). 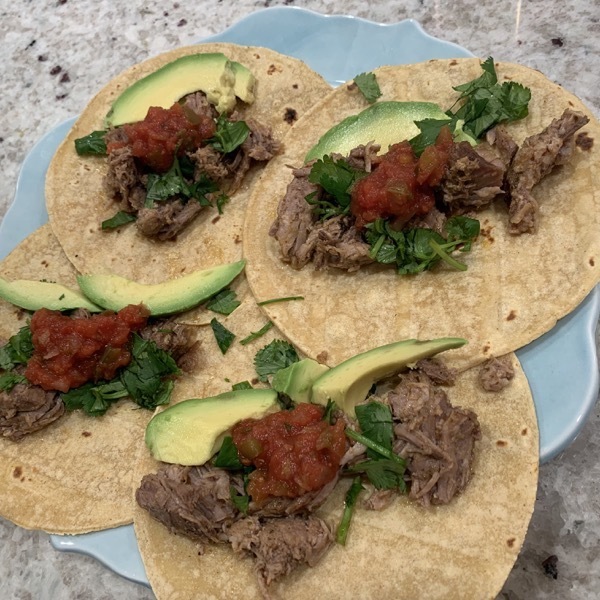 *For dinner last night I made these amazing Mexican Carnita Tacos… I doubled the recipe too so that I could freeze a lot of it for tacos next week too. *I talked about this on Instagram yesterday but I’m going to be running the Mini Marathon in Indianapolis on May 4th! I Am. So. Excited. Let me know if you are going to be there too. 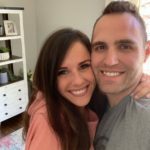 I’m doing a Live Episode with Lindsey Hein (<— she is doing an awesome giveaway right now) and Charlie wahoo! *And share some pink sugar cookies from Swig. 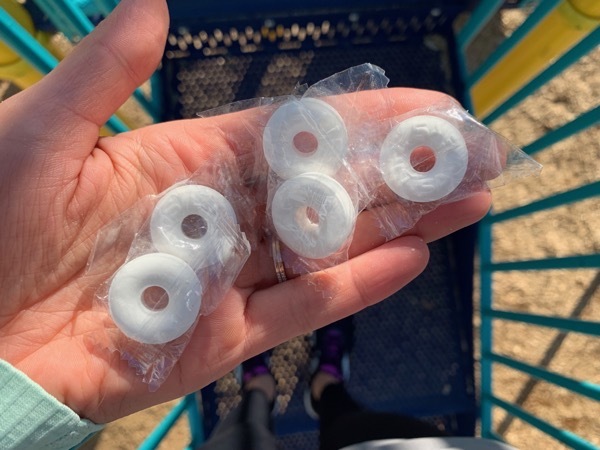 *I read somewhere that mints/mint gum taste really good towards the end of an ultra? Can anyone reading agree with this? *We were out on a walk yesterday and we ran into my mom as she was driving. *Taper Tantrums are in full swing over here. I can check off almost every item on this list below! *I know I know, I learned from my last marathon to avoid checking the forecast obsessively but for some reason it hasn’t stopped me this time. 50 miles is a LONG time to be outside and I really need to be prepared. As of right now it is looking PERFECT. *This is from the book that I used for my training plan. I am absolutely taking my extra energy to organize and prepare mentally for race day (even though my body is telling me to run more)! Another reminder of a new Friend to Friend post here! Fill me in with what has been going on in your world the last few days! Allergic to anything? Have any of your allergies changed at all over time? Taper thoughts/feelings…what are some of your symptoms? If you could choose the exact temperature of your next race.. what would it be? Workouts with my sister are as good as it gets. I thought the tantrums were going to be in relation to Skye. ha ha ha You’re so right though—the taper brings on some strange, out of control emotions and feelings!!!! I’m tapering (not so much. ha ha) for a 5K on Sunday, and I feel crazy just about that! I’m allergic to bee stings. I haven’t been stung in a LONG time, so it’s hard to know what my reaction would be these days. My oldest daughter had an allergic reaction to shrimp at one time. We really need to get her tested to see how serious it is/if it’s a real shrimp or shellfish allergy/etc. or if it was a fluke incident. I am SO SO glad that my kids don’t have more serious food allergies!!!!!! That has to be hard to live with!!! I’m tapering for back to back races (4 miler and 10k) this weekend and donated blood for the first time ever Monday to force myself to slow down this week! A surprise nasty blister is even keeping me from walking and enjoying our sunny spring preview. I have so far channeled my taper irritation into pushing my students to finish up their outstanding assignments. As I moved away from Maryland, I developed an allergy to crab and just learned last year I have skin allergies to fragrances and formaldehyde—in addition to typical seasonal pollen allergies. My ideal race temp is about 41 degrees and sunny and I might actually get it this weekend for my races! So excited for all that you have ahead for you! Keep going after those goals, girl!! When I’m ready, can we please run a race together??!! I’m so glad that you’re not allergic to grapes. They’re definitely one of my fave fruits, and I honestly wish I had a huge bowl of them right now. They’re so good frozen, too! I’m going to be running the Indy Mini too!!! It was the first half marathon I ran and this year’s race will be my 20th half marathon!!!! I haven’t run it in several years but wanted to return there for my half marathon runiversary :) If you need any Indy recommendations, let me know. I HAVE TO MEET YOU AND 20TH HALF MARATHON—-> AHHHHHH!!! Come to the meet-up the day before and I am so happy you are going back to Indy! Have a beautiful day Anne. Will you be posting meet up details closer to the race? I’ll be there if I am able!! Yes I will for sure!!! Those plank jacks with overhead presses look killer! Might need to incorporate those into my workout! Yes… do it! We did 5 jacks, 5 presses, 6 jacks, 6 presses etc etc up to 10!! Let me know how it goes for you! I am running the Indy Mini this year so hopefully I will see you there. I am doing back to back half marathons that weekend – Indy on Saturday and Pittsburgh (my hometown) on Sunday. Good luck this weekend for your Ultra!! YES YES YES… we are doing a meet-up the day before so PLEASE come! Back to back 1/2 marathons… you go girl!!!! I can’t believe you’ll be with Charlie! 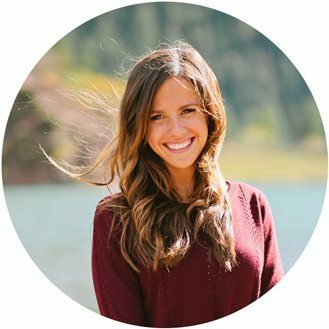 – I’ve been following her blog for a long time too. :) It’s like my worlds are colliding lol. Speaking of, another runner I follow, Heather aka Relentless Forward Commotion (Run Faster Mommy back in the day) posted an old pic of when she was at the Runner’s World festival, and you were in it! Small world. AHHHH YOU NEED TO COME WITH US!!!! Oh I love her, she is awesome! Have a beautiful day Amanda! I’m allergic to watermelon and walnuts. Not to a point where it’s scary, I guess it’s really more of an intolerance. I dream of running in 60 degree weather. The last few days have been a little nutty–disorganized work projects, lack of sleep from DST, kids being a bit cranky–I think it’s all related to being ready for spring. The tiny crocus and buds around my neighborhood perked me up for sure! I’m fortunate to not have allergies, even though many people in Maryland suffer through the spring and fall seasons. Taper is prime time for phantom aches and pains, so I hope you’re saved from that! I like to run on the warmer side…maybe mid-50s for a marathon? I am so sorry about how your week has gone so far! I hope this weekend is relaxing and rejuvenating for you! Oh yes to the phantom aches…. my right foot felt so weird yesterday but today nothing! Enjoy the carnitas and I’m pasting the tip from AK for your carnitas! I made a big batch of carnitas over the weekend and I HAVE to share this extra little tip. If you have leftovers/next time you make these please try…the extra time is SO SO SO worth it. After the pork is cooked and shredded, line a baking sheet with some tin foil. Spray the foil with a little non stick spray. Spread the shredded carnitas over the baking sheet. Put it under the broiler for about 10 minutes. My husband calls it “meat candy”. It comes out a little extra crispy and soo soo soo good. Hi Janae! I am a loooong time reader, but don’t often comment. I have loved following all of your training over the years! I’m currently training for my second marathon in May, and so I’ve been reading a lot of your old marathon training posts for inspiration! I will be traveling to my marathon and staying in a hotel the night before, so I was wondering if you could offer some tips or do a post with tips for traveling in terms of nutrition/meals before a big race! I can’t decide if I should pick a restaurant and choose a meal ahead of time or bring food with me that I know works or what I should do! Also, I am thinking about ordering the koala clip, but I’m not sure what size to get, and wondered if you had a suggestion! AHHHH EMILY!!! I am so so excited for you and your second marathon, you’ve got this girl! Please let me know how it goes. First, what phone do you have… then we can choose your Koala Clip size. As far as traveling goes before a marathon, my best advice is take out. The busy restaurants can bring on stress/use up energy and so if I can get a meal to go and eat at the hotel at the time I want to eat, I’m golden. For St. George I ate spaghetti with grilled chicken at the hotel on my bed and it was perfect. If packing your food is easy go for that (I packed my breakfast). You’ve got this and I need to write a post about this with more details. KEEP ME UPDATED!! THANK YOU EMILY! For the Koala case, I have an iPhone 7 and my case isn’t too big (just enough to protect it as I drop it many times throughout the day haha). I’d like to be able to put my fob and Huma gels in there, too, so I couldn’t decide if I should go for medium or large? Or if I should use the Nathan Zipster belt instead? SO many decision to make haha! Oh the nutrition makes the biggest difference!! I would definitely go for the Koala Clip (I don’t even feel my phone with it but the Zipster belt works too)! I never have tried putting my gels in the koala clip though… let me know what you think of doing that, I might have to copy you! HRG10 gets you 10% off too at Koala Clip. Have a wonderful day! Thanks so much for the code! :) I am going to go for it! Have a great day! Gah, tapering is SO terrible. I feel for you!! I’m already dreading the taper and I still have a month before I’m in mine. I cannot wait to hear all about your race! Yes, I dread it too. Yep… this morning was SO SO hard to get out of bed because of the darkness. Warm weather we are reading for you:) . Have a beautiful day Chelsea! Janae….I need your help. Since my half 2 weekends ago I had been having shin pain, hip pain, and now foot pain. I worked it out with my ART doctor but my right foot has just gotten worse as I’ve started running again. I realize it is probably plantar as it hurts terribly in the morning and feels fine after I start running. So, I purchased one of those night stint things that I heard you mention in the past. but do you have any other advice? Also, I just fully believe in taking time off running while something like this flares, but its also so devastating to me when I have made so much progress since October and now I’m going to sit out, plus its my stress relief. So, any tips on dealing with that? Thanks so much, have a wonderful day!! Oh noooooooo!!! Eleanor, I am so so sorry. I would absolutely take some time off. Your body might be begging for a bit of time away and you won’t lose that much fitness but you will lose more fitness if things get worse and worse and you have to take more time off. Did your ART doctor scrape it? That always helps mine… so does the boot and time off. I haven’t found any other options. I am SO so sorry! Focus on getting in some strength training and yoga. You’ve got this girl and I’m cheering you on to get this fixed! Thanks, Janae. I know my body has been asking for time off after 5 months of straight building of speed and distance. So I’m definitely going to focus on strength, yoga, stability, and low impact cardio like cycling at the gym. I have the same thoughts about taking time off….if I don’t do it now it will be a much longer time off down the road. I will definitely discuss that with my ART doctor and use the boot at night and hopefully that all helps since I’m catching it early. :) I appreciate your encouragement, always! First – I totally read that as taper tantrums not temper tantrums, haha! Second – when you are in Indy, GET SQUARE DONUTS!!! Original, glazed square donuts. You need these in your life. Even if only for a couple days. Hahaha I probably wrote it out wrong! I cannot wait for the square donuts… I will dream about them every night until they are mine. Thanks Tara and I hope you have a wonderful day! This is BRILLIANT. I will absolutely be doing this because I was thinking (as I was eating) about how my favorite taco shops have their carnitas a bit more crisp and how much I love that. THANK YOU and have a great day ! HA HA HA HA HA I read that as ‘temper tantrums’ and not ‘taper tantrums’ on first scroll!!! Sigh. Those Glycerins. They’re beautiful. I want a pair. Badly. I wish I had more to say. I’m just so tired right now it’s a pretty big struggle bus to keep my eyes open (and I am at work)–WITH one caffeine pill (half a cup of coffee’s worth of caffeine) and almost all of a trenta-sized iced green tea with no sugar from SBUX. I’m tired. I need a big vacation and to know that things will work out. One of these things I can solve (if I can find the money)–the other, well, I can send every prayer, wish, hope, and request for help out into the universe and just see what gets spit back at me. But for now–I will just send all the good I can into the universe for your racing day coming up! AND FOR INDIANAPOLIS! That will be such a FUN FUN FUN run. I am excited for you!!! BAHAHA I wrote temper instead of taper at first… oops! Oh that is a lot of allergies! I really hope that you get a good night of sleep tonight! Thinking about you and thank you so much Stephanie! I’m a morning person so this time change has been messing with me. I won’t say that the extra hour at night does a heck of a lot for me…I prefer the morning light. I am glad you like the Glycerin. It’s been a staple shoe of mine for a while and I actually just reviewed the 17 today on my blog. I’m with you… send the morning light because I’m already ready for bed at 7 at night haha. They really are so great, can’t wait to check out your review. Have a great day Hollie! 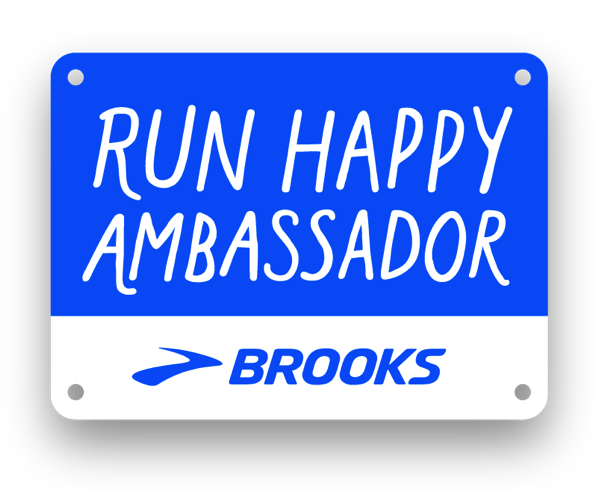 When I first started running I would take taper very seriously, have a lot of pent up energy and clean my house a lot in those weeks. Now, when I taper, I’m exhausted and love the extra rest! I think the difference is overall mileage accumulation? I can’t believe your race is so soon! After 2 weeks of the cruds I’ve started running and going to the gym again and everything hurts! I don’t know if I like this pain or loathe this pain! Ha! All of my PR’s have been in cold weather but I don’t like being cold. 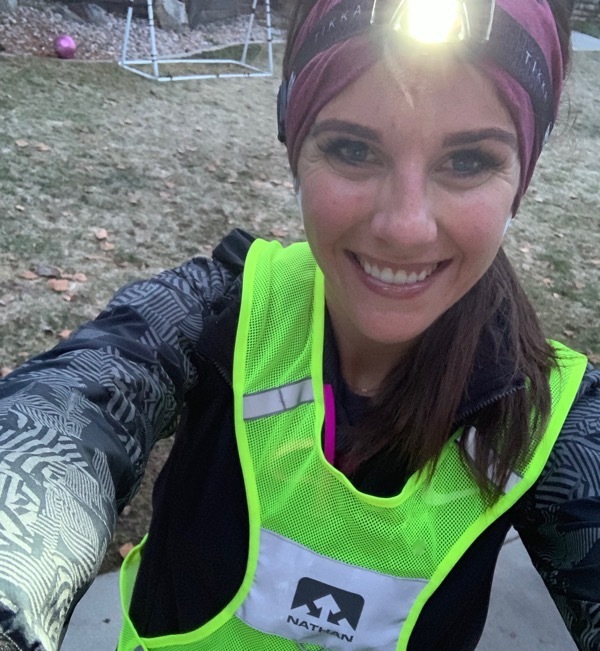 Granted, I am one of those who runs in shorts in 30 degree’s but I also have like 10 layers on top so I feel like everything balances out :) I like any temp i can run in tank and shorts – my go to run apparel. And a belated congrats to Andrew on finishing his race! It blows my mind he can race without “proper” training! Yes, I think you are right on with your taper theories! I am so glad you are starting to run and go to the gym again… I think we like it or else we couldn’t keep doing it:) . NOOOOOOOO to the cheap chocolate. I’m right there with you on your 30 degree wardrobe selection. Have a beautiful day and thanks Jenny! I think I am allergic to cheap chocolate too. The morning after halloween I woke up with a swollen numb lip. Then it happened again 24 hours after eating hersheys cookies and creme candy. They put weird stuff in that candy and the allergy seems kinda common reading online?! Your race is so close! You’re going to kill it! I am allergic to gluten. Eh, it could be worse. I go for another allergy screen in two weeks so hopefully there’s nothing crazy added to it! Oh I hope so bad that it stays with just gluten! Good luck! Thanks Marissa and I hope your next race stays at 45 degrees! Dang Janae, negative 44 degrees is pretty cold to race in ;) Also that salad is pretty close to the Platonic ideal of a salad. So it’s been a week since I was rear-ended and my neck doesn’t hurt much anymore and I can turn it well, but I tried running a little on Monday and it gave me a slight headache, so I think it’s still too soon for that. The elliptical is a bit better so I’ve been doing that but I think it tires out my neck because afterward it starts to feel kind of weaker. 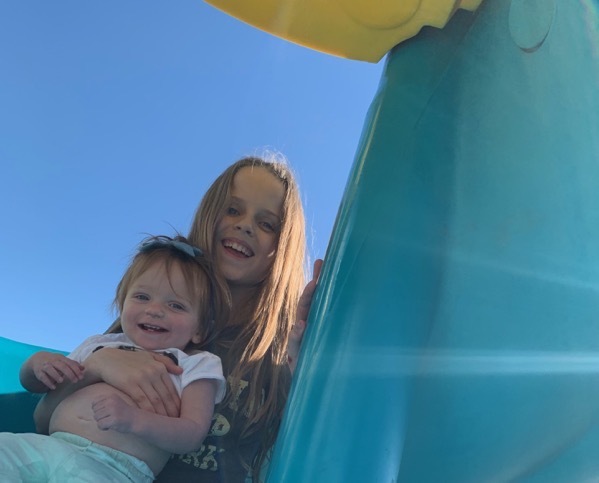 I wish I could run and it’s hard to not be upset that this happened but I know it could be much worse… Hopefully it won’t be too long before I can ease back in because I’m having some of those taper tantrum symptoms haha. Hahah I didn’t even notice that! I’m so glad that your neck doesn’t hurt anymore. I think you are being so smart to stick to the elliptical for a while. So happy you are okay! When I did a 50 miler it SNOWED, sleeted, and rained almost the entire time (in April!) and I was so drained by the end! All I ate on the trail were PBJs, gummies and candies, and SALT. Definitely take some salt pills with you! Toward the end I craved all the salty snacks at the tents like pretzels and chips! I would pack a variety of snacks and real food because you’ll never know what you’ll crave! CASEY… WHAT?!!? How in the world did you survive that. You are my hero. Would you recommend taking a salt pill before / during or both? I’m already looking forward to the snacks at the tents. Thank you for these tips, I really need these! Thank you so much Casey and I hope you are having a great day. I started taking them 30-60 minutes in, almost exactly in concert with my other fueling. There were instructions on dosage/how/when on the salt pills I bought, so hopefully that helps! I think it just helps to replenish all of the salt your body is losing during the race and helps prevent cramping! 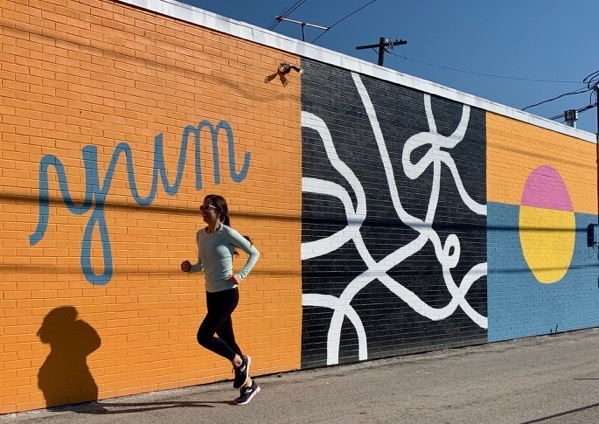 Depending on how long you’ll be there, consider checking out the Indianapolis Museum of Arts + gardens, the Children’s Museum or zoo if the kiddos are coming along, Eagle Creek Park, and the Broad Ripple neighborhood for dining and live music. Oh good luck at the Savannah Women’s Half! That is so exciting and thank you for the recommendations, I will be bringing the kids so this is great. THANK YOU! Foodwise the only allergy I had was eating pumpkin spice ice cream from a local place. My tongue got really itchy. I’ve never had there’s again but have had other brands with no problems. I also eat a lot of pumpkin spice things and nothing else has ever done that to me. I would still get tested for a grape allergy before eating more of them, especially if it is involving the throat reacting. Just to be extra sure you aren’t allergic. The skin prick allergy tests are very fast and accurate. It could be the type of grape too.. who knows. Plus they can test you for a bunch of other common allergens to see if it was something else. That is a really good idea… thanks Amanda! I hope you are having a great day! Ugh, taper can be the worst! 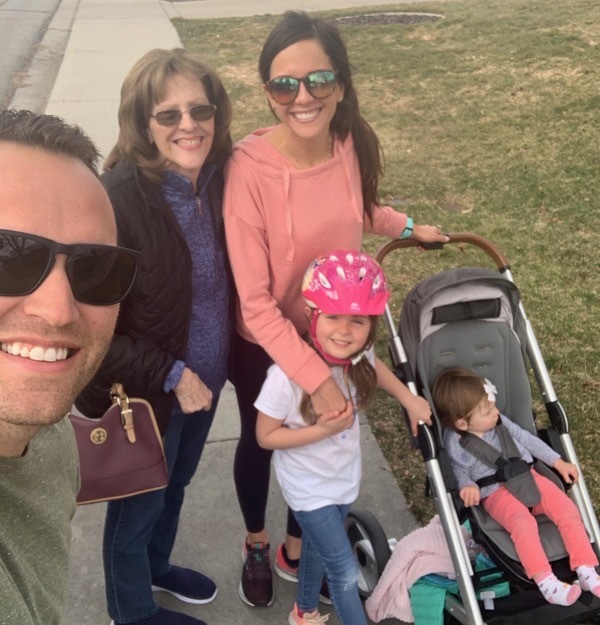 We have enjoyed a couple days of nice weather here in Colorado too until today we were hit by a bomb cyclone (I wish I was kidding). Between the blizzard and darker mornings it feels like I will never run anywhere but my basement treadmill again. Hopefully race day will stay perfect, have a great day! NOOOO that is crazy Beth!! 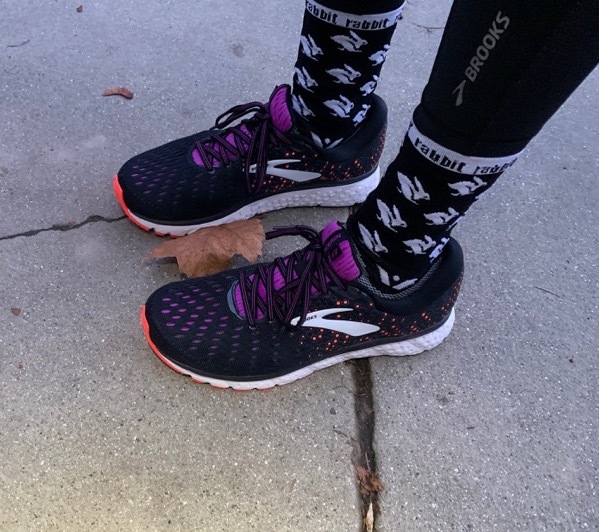 Stay warm and hopefully you are outside running again soon! I absolutely cannot wait to meet you! Could you come to a meet up the day before???? And I need to find a way to get to your ice cream shop!!! Late on the comment game BUT I know you like to read these anyways! Tapering for a marathon, so great reminder that it’s okay to feel lazy and unmotivated :) I think my ideal temp for a race is 55, which is hotter than what most people would say, but I’m from the south so I feel like my internal thermostat is just a little higher. Andrew and I have VERY different perceptions of temperature, LOL. 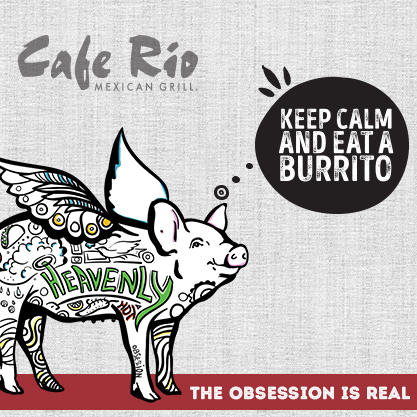 Speaking of opinions, I actually disagree with most of your food opinions, I’m sorry to report. I despise candy in general but hate mints and want to gag whenever I think about them. I feel like whenever you post about food chances are I disagree but we can agree on Mexican and the importance of spaghetti. Anyways. I have a nut allergy , never grew out of it but it lessened in severity. I also have a lot of really severe medication allergies that have worsened over time. They are mostly to antibiotics. I learned this when I first got prescribed them as a kid but had a reaction a few years ago that was bad because I touched a pill, but didn’t take it. I have had oral allergies before like how you’re feeling with grapes (I don’t agree with grapes and cottage cheese at all, haha) but with tropical fruits. Some of those have changed over time so it’s possible you’re over it! YES!!! I am so thrilled about this! I must meet you! I don’t have the details yet but I will write a blog post asap about it once we find out! Thanks so much! Yes, please talk to an allergist. You may have OAS (oral allergy syndrome) which usually does not cause anaphylaxis. My daughter is anaphylactic to peanut, treenut and sesame. Good luck with the taper…you’re so ready for this race!! I’m running the mini marathon in Indianapolis!! Can’t wait! Ahhhhh wahoo! See you there! I am so excited that you are coming to Indy! I’m running the mini too. Can’t wait!!! You’re going to love it.